Quality crystallised furniture handles decorated with Swarovski crystals! Our company deals with Handles for furniture manufacturing. Handles for furniture decorated with Swarovski crystals and a wide choice. 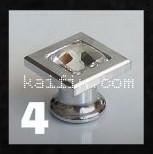 Furniture Handles of different colors and shapes are available. All furniture handles decorated with Swarovski crystal! When it comes to designing a kitchen, bath or any other space in your home with cabinets, choosing the right knobs or handles is paramount. The options are seemingly endless, but for a fresh, modern twist, even in a very traditional space, bar pulls are always a terrific bet.